Recorded: Hankyu Nishinomiya Kyulo, Osaka Japan October 24th. 1982. Comments: A bit cheap cdr release of the vinyl album with same name. This cdr release has a different cover than the vinyl album. Not complete show. 'We Will Rock You' slow version at the end is missing. The Elton John cover 'Saturday Nights Alright...' is more than less a improvisation version. Only words Freddie sings, is the title track. Actually a nice concert. Would have been great on a proper officially live album release. 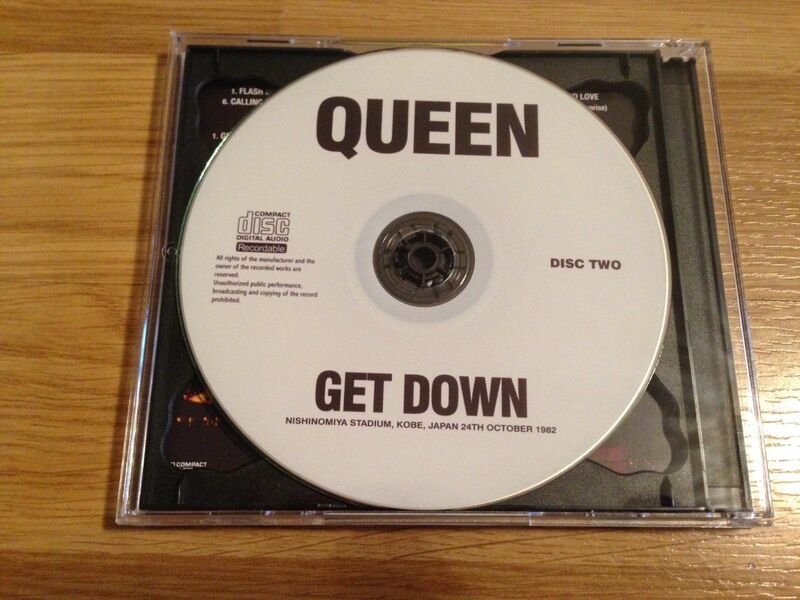 Roots: GET DOWN vinyl bootleg. The legendary masterpiece is the release decision. This work is a CD version of the 2-piece LP boot leg "GET DOWN" that has been loved by fans for many years. The sound source has recently been digitized by foreign core enthusiasts, is a gem that has become a topic that sounds great. 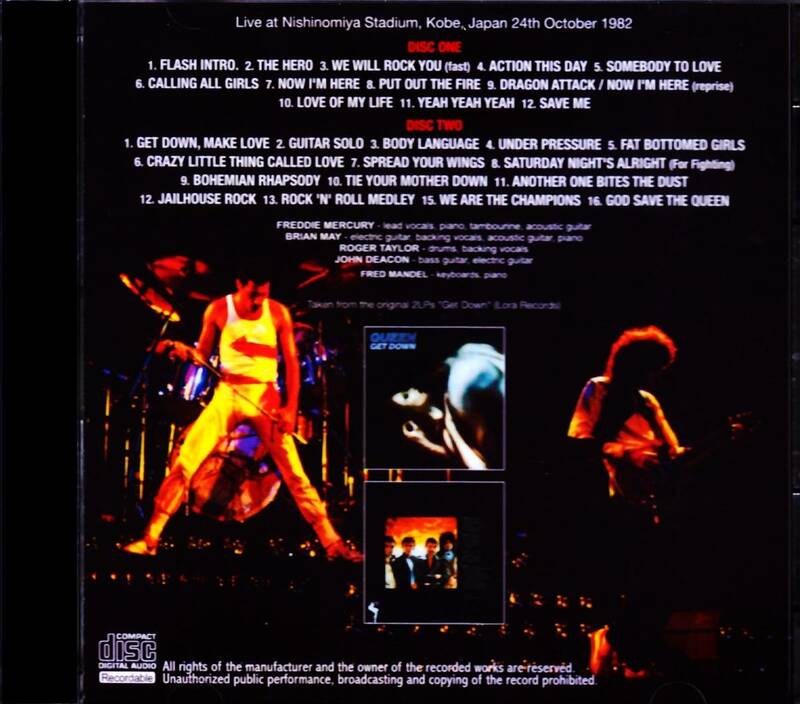 What was recorded is "October 24, 1982: Kobe Nishinomiya Stadium" performance. It was one act of the 5th Japan Tour. The official video "LIVE IN JAPAN" has also been born from this performance in Japan, and we have reported on a number of live albums in addition to the DVD of the highest quality board ever recorded. First, let's check the situation on a schedule. ・ October 26: Nagoya International Exhibition Hall "FIREDANCE"
・ October 29: Hokkaido Industrial Cooperative Venue "GOT THE POWER"
・ November 3: Seibu Stadium official "LIVE IN JAPAN"
Above, all 6 performances. This week, the official film will be revived with the highest quality ever recorded, "LIVE IN JAPAN: SEIBU STADIUM 1982" will also be released, but what is included in this work is the third performance that is 10 days before that. Such a main point of this work is a sound too great. After all, the analog board which became the origin is a name recording in the name recording which has been the representative work of "HOT SPACE TOUR 1982" for many years. Not "Best of the Day" or "Best of Japan Tour", it has been acclaimed as "One of the Best" worldwide. This work which digitized it with the latest equipment is just an excellent item. It's clear that it's a bold and clear sound, as it used to be a sound board and a title that has been hit. Vibrant insults and clapping are the proof of audience recording, but the direct feeling of the performance and singing voice that completely controls it is overwhelming. The pitch which was crazy in the existing release is normal, and the taste of the transparent sound is reprinted wonderfully by the vividness which seems to be the latest equipment. However, no matter how good the sound is, the contents can not be reigned on the throne of “Tours representative work”. This work is also worthy of honor in the masterpiece in that respect. As mentioned above, it will be before 4 performances of the official video, but the performance is the difference of clouds and mud. It is clear that the performance filled with the spirit is strong, and Freddy also jumps from the beginning "Hello, Osaka! How is it? Is Everybody OK tonight? Yeah, yeah !!" Unfortunately, "We Will Rock You" has not been recorded because of the faithful reprint of the analog, but it is possible to taste the QUEEN to ride on Nori in a great condition almost with a full show. The appearance on the tone blurs from the set. 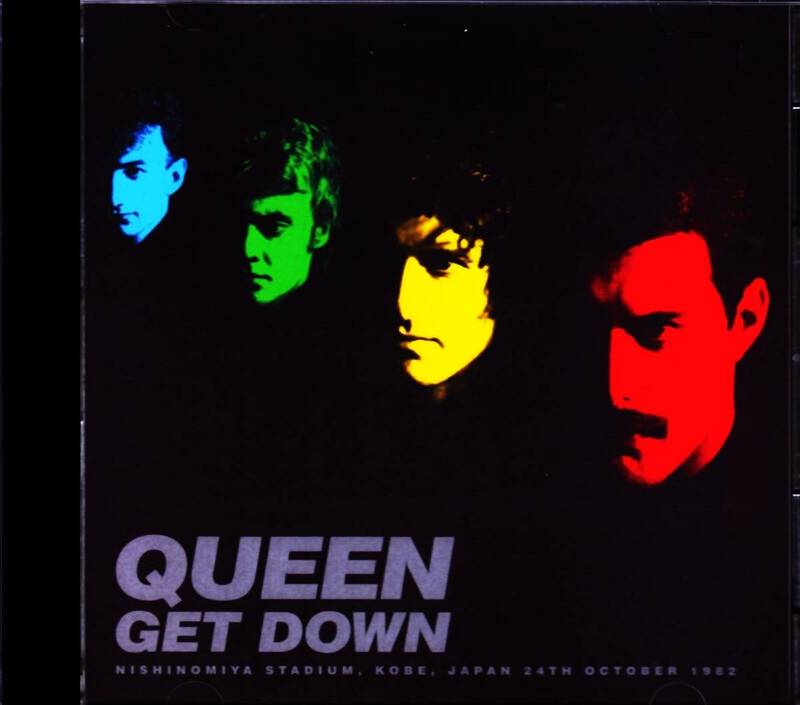 A strange "Spread Your Wings" pops out in front of the medley of "Saturday Night's Alright (For Fighting) / Bohemian Rhapsody", which was also played in Fukuoka performances, but Freddie said "Forgot the code!" I scream and move to "Saturday Night's Allright For Fighting". Furthermore, the medley connecting "Another One Bites The Dust" to "Jailhouse Rock" is also extremely rare. The “HOT SPACE” number, which was only played on this tour, was also impressive, and the colorful synth sounds were intense “Action This Day”, the exhilarating melody was fun “Calling All Girls”, and at that time shocking “Body Language And so on ... At the time, it was hard to accept, but now it comes out with a series of performances that feel nostalgic. It is a live album with a great tone engraved with a nostalgic but new sound. For enthusiasts, it's a more memorable name recording than the official video. One legendary sound revived by the hands of a core mania. Please enjoy as much as you think.